John Flemming makes a beautiful line of accessories. Prominently featured are his �Slip Top Bags�. These bags incorporate a unique opening method of simply sliding the cover upwards on their laces, exposing a purse underneath with two pockets. The basic �Slip Top Bag� is offered in a wide variety of richly textured and colored Italian calfskins and are all accented with small sterling silver details. They are available in two sizes, [8½� x 6½�, and 7½� x 5½�]. A very special “Limited Edition� line of these �Slip Top Bags� is also available with beautiful “Sterling Silver and Gemstone� medallions. His �Punch Belts� are offered with several punch designs, [Dot, Star, Heart, etc.]. All of the belts are made of imported calfskin, and come with a solid brass, brass with nickel plate, or stainless buckle. All of the belts are entirely handmade of imported calfskin, to order for your size. 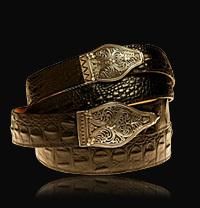 Flemming has also created a line of belts with �Sterling Silver� buckles. Prominent among these are his �Cobra Belts�. These belts come in two widths, [1� and 1¼�], and two patterns, [�Water� pattern and �Floral� pattern]. Beautifully embossed Italian calfskin leather is used on these belts. The �Cobra Belts� belts are also made to order for your size.